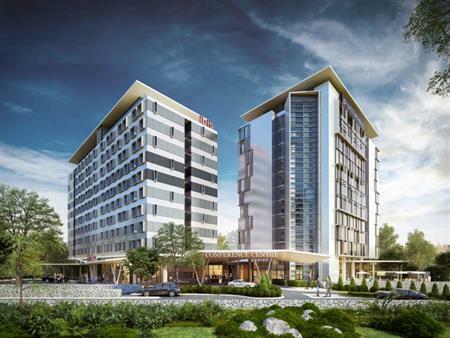 Construction of the AUS$150 million Brisbane Airport Hotels and Conference Centre commenced last week. Setting a new benchmark as the biggest external development venture and first five-star hotel for Brisbane Airport, the development will feature two Accor-branded hotels, the five-star Pullman Brisbane Airport and the 3.5-star Ibis Brisbane Airport, bridged by the Brisbane Airport Conference Centre and located at the domestic terminal precinct. "Last year the Guide to Hotel Investment in Brisbane highlighted that a shortage in internationally-recognised, full-service hotel rooms was causing Brisbane to forgo 121,000 visitors a year, and was hampering Brisbane’s ability to attract major events and conferences," Quirk said. He added that the construction of these two new hotels and convention centre will allow Brisbane to attract some of the $114 million a year in previously missed economic opportunity and drive international exposure of the city. The development includes a mix of 373 suites across the two hotels, as well as 1,735msq of conference, meeting and event space in the connecting conference centre.